Starring: Simon Pegg, Nick Frost, Martin Freeman, Paddy Considine, Eddie Marsan, and Rosamund Pike. Synopsis: Five friends attempt to recreate a pub crawl in their hometown when they start to figure out their town has drastically changed. It would be easy to boil down the third film in director Edgar Wright's "Cornetto Trilogy" (a trio of films which features SHAUN OF THE DEAD and HOT FUZZ as well as a specific Cornetto ice cream flavour in each) as a simple comedy about friends trying to relive the good ole days but are interrupted by aliens that take over their hometown. Even though that does correctly describe this film, writers Wright and Simon Pegg were able to find that rare balance of side-splitting comedy, exciting action, and likable, well-rounded characters. 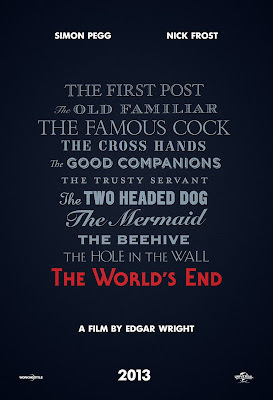 There will be debates for years over which of the trilogy is the best film, but the pinnacle, THE WORLD'S END, is by far the smartest. There's always that one friend of yours that never seems to understand that, at a certain point, it's time to act like an adult. They love trying to relive their younger years and still dress as if they're perpetual teenagers. Simon Pegg's Gary is "that" friend. A man on the wrong side of 40, who wants his gang of friends (including Nick Frost, Martin Freeman, Paddy Considine, and Eddie Marsan) back together to finish their town's infamous pub crawl, 12 drinks at 12 different pubs, which they failed to complete in their heydays. However, all of his comrades have moved on and are well established in their white-collar jobs and lives. He convinces them to trek back to their hometown, but chaos ensues as they go from pub to pub and learn that their town and its people has been taken over by aliens. Wright and Pegg could have easily written a fun action romp where old friends bond again as they try to save their hometown from these invaders. But he takes it a step further and explores deeper themes of dealing with mid-life crisis, regrets, and friendship. Even though Pegg and Frost are at the forefront of the drama, each supporting friend is given his own small arc. These moments are skillfully sprinkled throughout the action giving weight to the characters and actually raising the stakes when the action gets intensifies. Unlike some other films which feature actors who are friends in real life (cough, GROWN UPS 2, cough), this film feels like a real heartfelt project between people who really enjoy working together. It's as if they don't care if the movie does well. They had fun writing and making it, and that energy is infectious throughout the film. The action doesn't take a backseat to sentimental moments or the witty dialogue. As proven in his previous films, Wright knows how to frame and shoot intense action sequences. The last act is almost non-stop action, and it kept me guessing at where the film would end up. But the most phenomenal piece was the first encounter with the aliens. The sequence is probably one of the most intense fight scene so far this year. Think the intensity of the hand-to-hand combat fights of the Bourne films, but sprinkled with British humor. 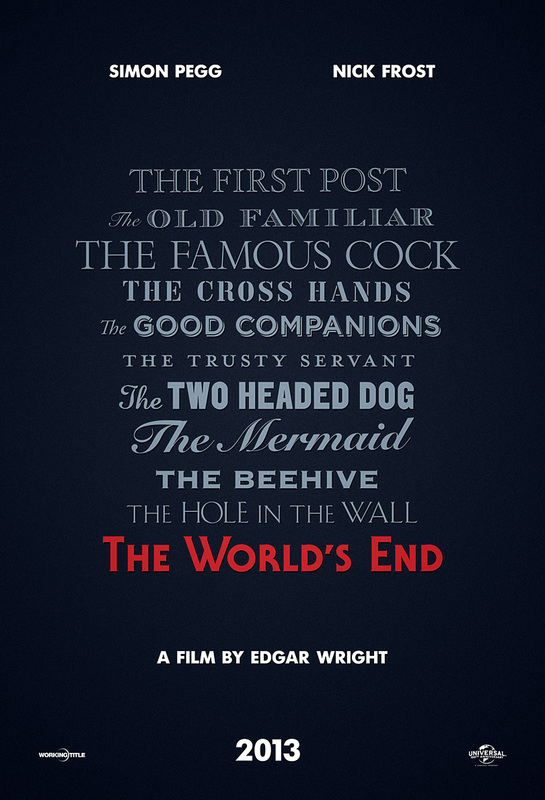 THE WORLD'S END will end up being some of the most fun you will have at the movies this year. It's smart, funny, and makes you want to gather your old friends to drink some beer. But maybe skip the part about going to your hometown because it might not be the same. It's sad to see this trilogy come to an end. But Wright has given us a hell of a conclusion. Cheers!